Updates 2/19/2018: Lots of new things have been added since I wrote this in December. I've written here and here about our middle school math project funded with a MACUL grant. 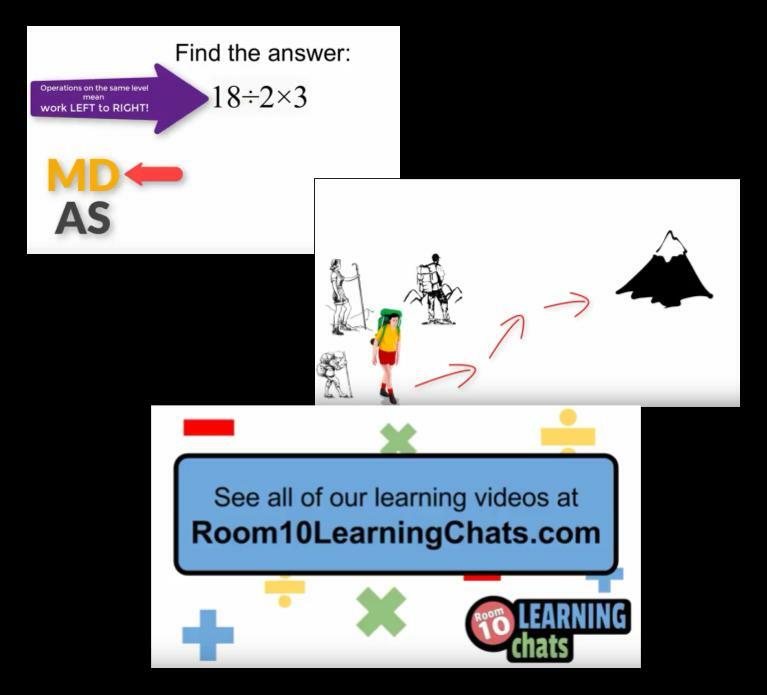 We've been making learning videos for and with students in 6th grade math. 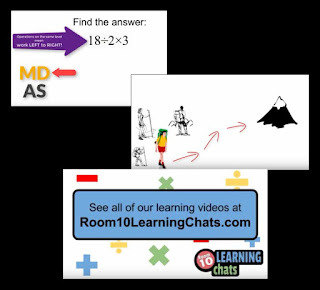 We post the final videos at Room10LearningChats.com. Since I'm an instructional tech coordinator and not a classroom teacher, I've been working with Brenda June's students. This exciting project that has required us to stretch as professionals. We meet several times a week to plan videos and discuss what we are learning. As you'll read below, it has been challenging at times. Our goal now is to glean the many excellent things we are learning from it so teachers can do the same without spending all the time we have. We will share those insights here, in our videos and at the MACUL Conference in March. Here's a summary of big ideas and some practical insights we've learned so far. 1) Students love making videos for other students. When I wrote the grant proposal, I hoped this would be the case with most students. But when we started out, the enthusiasm I saw in class surprised me. Initially we kicked off the project in every one of Brenda's classes. Out of more than one hundred students, I only saw slight resistance from one student when we asked them to make their first video. Within minutes, even that student was engaged in the task. Before we had anything like an audience for our videos, students excitedly ended their lessons with phrases like, "Thanks for watching," and, "Be sure to see our other videos." As you'll see in my next point, this is not the dream project to solve all the challenges of teaching math in middle school. Still, the idea of helping others learn and sharing their work with a wider audience changed class from the "got to do this" mindset to "get to do this". 2) It's harder than I expected to do this on a large scale. There's no way around it. This is a challenge and we are trying to figure out exactly what we recommend for other teachers to try. I did learn a few practical things that I'll list below, but student created tutorials take a lot of time and effort. I make a lot of video tutorials and I've worked with students for years to make them in class. I didn't think technical problems would take so much time. On top of that, it's difficult to find time during class for students to get free to record a tutorial. Some of this is unique to our situation. I wrote the original proposal for a different class at the elementary level, but that teacher ended up in a new position. Brenda was glad to try this project, but we almost certainly would have written different details for use in her secondary classroom. We want to focus on why more than how in our lessons, but it requires students multiple takes just to successfully show how to do the problems. As I mentioned, attitudes have been great, but it surprised me how long it would take to work through a multi-step problem without a mistake. The microphone was picking up far more than just our narration, and sometimes not even our narration! After recording our first "polished" tutorial, we realized every time the students touched the table, it was being recorded as a loud thud by the microphone. Add another 15 minutes (1/4 of class time) to that one! Even if the explanation and math work is perfect, students might mumble, misspeak or write illegibly. There's a lot to get right! Editing takes longer than expected because of the mistakes. We've improved in this greatly, but our student created tutorials are much simpler and less polished than I originally envisioned. I thought I'd be able to get by with students doing most editing in iMovie on an iPad or WeVideo on Chromebooks. Instead I've had to do the editing and some of it has been very complex. I need higher end software too. More on this below. 3) Focused discussion with colleagues is invaluable. This has been a key takeaway, as Brenda and I have had to spend hours working together on this project. We already knew collaboration is valuable, since we met almost weekly last year and have done many other projects together. This one has been particularly helpful, though, because we want our Learning Chats to focus on how to learn deeply. Brenda and I read Mathematical Mindsets and a lot of other research about good teaching. She has spent her career constantly improving how she teaches and she's been focused on excellent discussion techniques in class for the past year. This project came at a good time, since she is excited about what her questions in class have uncovered and how we can address the misconceptions and gaps the students have in their learning. It might not be completely clear in the videos we've completed so far, but what we've discovered and how we see it impacting students has been invigorating. Our most popular video so far touches on some of this. Be sure to watch The Learning Journey if you haven't seen it already. Part 2 should be available soon. 4) You can see (and hear) students' misconceptions by having record their explanations. We suspected this of course. I mention it here because it's another sign that we're onto something important. When we first started the project, we had every student make a quick, informal video tutorial. Had they done their work only on paper, many of the problems would have looked correct. Hearing the thinking (or lack of thinking) behind each of their steps gave us much more insight. 5) Practice before recording is the key. This will also seem obvious, but it is worth mentioning. Anyone who has made a video knows that better preparation for recording saves a ton of time in editing. More than that, though, the practice I do with students before recording a Learning Chat gives me an opportunity to ask good questions and get them thinking about why they are doing what they do. A good example of this came from our tutorial about multiplying fractions. The discussion we had before recording that required the students to think more deeply than they were about the process. It also was one of our easiest to produce. We decided on Educreations for informal tutorials in class. We tried Show Me first, but went with Educreations in the end when we wanted every student to record their work. We ran into fewer technical challenges with it. You can see two examples at the bottom of this page. It costs about $12 a month for the premium version that allows for easy sharing with the teachers. I used to love Explain Everything on the iPad and I expected this would be the main tool for all of our polished tutorials. Well, they have added a lot of features since I used it and that has added to the complexity. It's still a great tool, but it's too complicated for the students. It posed challenges for me and Brenda as well. And it's over three times as expensive as it was when I bought it years ago. For now, I set up the problems and pages in Google Slides and then transfer them over to Explain Everything for the students to write on during recording. If they only write on it rather than construct all the slides with it, it serves its purpose well. I absolutely love Camtasia for editing. 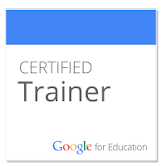 It's expensive, but I get a free copy as a Google Certified Trainer. I've used it for years to make screen recordings, but recently I've started using it for all types of video. The animation features are excellent and the ability to quickly work with multiple layers is extremely helpful. I highly recommend it if you create professional tutorials or videos. We use the iRig Studio microphone with an iPad to record narration. I like it, but as I mentioned above, it picks up every tap or movement on the table. I'm sure there are some shock mounts that would help, but our low budget approach has been to set it on a folded cloth, such as a towel or (in a pinch) a student's hoodie or stocking cap. So that's a summary of what we've gained so far. I look forward to creating many more videos over the next eight weeks as we prepare to share in our MACUL presentation!